Israeli Arab documents rail work on Shabbat, in violation of minister's pledge to haredi MKs. Despite a pledge by Transportation Minister Yisrael Katz to ban infrastructure work on Israel’s rail system during Shabbat unless deemed absolutely essential, the ministry apparently violated the ban this Saturday. An Israeli Arab who has been monitoring the phenomenon reported it on Sunday. 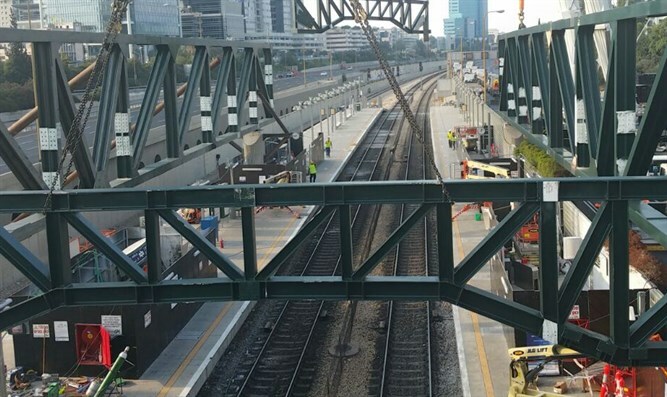 On Sunday, Behadrei Haredim released footage taken by an Israeli Arab man of work being done on Saturday on the rail system near the Ayalon freeway. This is the second time that the man documented work being done on Shabbat in violation of the ministry’s promise. The first time was three weeks ago, a day after a coalition party heads' meeting in which the prime minister appointed Yoav Hurwitz, the director of his bureau, to end the crisis with the haredim over public Shabbat work. The Israeli Arab, who works in a haredi institution during the week, warned the haredi public that despite promises made by Minister Katz, work was still being done during the Jewish day of rest. During the previous meeting between Hurwitz and the four haredi MKs, it was agreed that Shabbat work would only take place for safety reasons and after it was authorized by the four MKs. However, according to the present documentation it is apparent that this promise was not kept and the Shabbat continues to be desecrated by the Israeli government even while haredi parties are coalition partners and represent an integral part of the coalition.